I’ve been very tardy in updating the blog of late, a trend I hope to reverse in future as I’ve built up a back-log of interesting book covers. Unfortunately, it is proving difficult to find information on a lot of the designers and illustrators and that is causing me to hesitate about posting covers. I will try to keep updating at regular intervals regardless of the depth of detail I’ve managed to amass on the artist involved. Recently, Will Schofield of the excellent 50watts blog (formerly A Journey Round My Skull) featured 14 covers of Irish language books from the 1930s from my collection. The covers include artwork by Austin Molloy, George Altendorf, Olive Cunningham, Michael A Keane, and Victor Penny, all of who studied illustration and layout at the Dublin Metropolitan School of Art (now the National College of Art & Design). Above are four of the featured designs by artists that I have been unable to identify. The bold flat colours really jump off the page and make a great argument for embracing spot colour printing in contemporary book covers as the ubiquitous four colour process (CYMK) can’t come close to reproducing such vivid shades. I hope to feature Molloy, Altendorf, Cunningham, Keane and Penny in individual posts as each is a significant book jacket artist in the their own right. In the meantime, take a look at some nice examples of their work over at 50watts. While I normally like to post a number of similar or related covers together, I’ve been struggling to find anything that I could group with the above design. 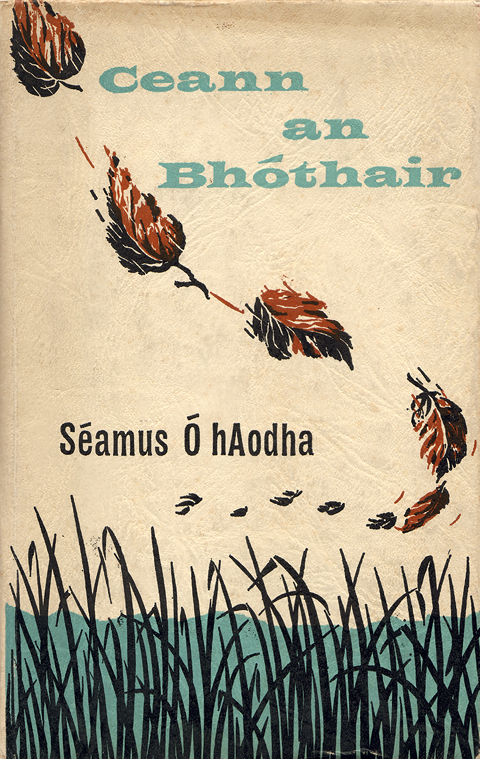 It’s a beautiful three colour illustration, for a mid-sixties collection of poetry in Irish by Séamus Ó hAodha, but no artist is credited. The textured paper wraps directly onto the hardback boards and feels like a children’s book, an impression that the illustration accentuates. This is a great example of mid-century ‘naïve‘ design that is currently enjoying a revival. The use of the term ‘naïve’ to describe this style is rather inappropriate, while the designs have a childlike quality the artists behind them are invariably well skilled and knowing. I picked up this booklet a few years ago for the princely sum of €1 – drawn in by the amazing cover rather than the promise of the story within (my Irish is not great). Published in 1960 by Oifig an tSolátair, this is the sort of artwork which makes serious designers cringe but is really a wonderful piece of vernacular design. The title translates as Eamonn Róg, The Half-Witted Cowboy and we can only imagine the shenanigans our hero gets up to after he hitches his horse outside the GPO and moseys on up O’Connell Street. What a great juxtaposition of iconography – the GPO, Tri-Colour flag, Nelson’s Pillar, the green double decker and the Garda looking on while the sheriff steps straight out of a Western movie and onto the streets of Baile Átha Cliath. Yet again the cover artist is uncredited but more examples from the same hand – with one credited to a mysterious L.M.S. – can be found in this gallery of fantastic covers from An Gúm/Oifig an tSolátair publications.